As we gaze into the candles and fires that form the centerpieces of many of our winter traditions, we can explore the relationships humans have to the physical world. - Could it be that it is not only cultural nostalgia that draws us to these iconic practices? - Could it be a tickling of our ancestral past - memories of family celebrations, taken deeper, blending into feelings of protection from the unknown wild? 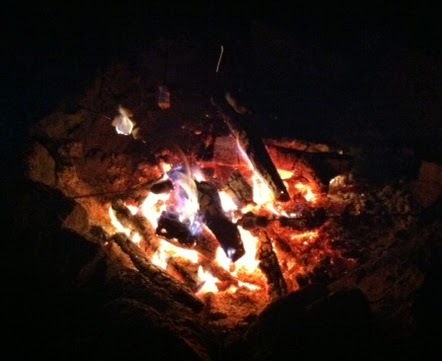 - Is it a distant perception of our ancestors sitting around a fire for warmth and security? - Could it be that at some profound level we have an awareness of our intimate relationship with the universe? - Can we can draw connections between our celebrations of light and the fact that we all come from light – light of the great improbable flaring forth, that tremendous burst of energy that erupted from nothing into all that we now know, and more? How incredible to help children make the leap between the bundles of energy dancing in our eyes at the holidays, and the photons present at the very beginning of everything. We are all children of this light. (This piece was originally posted here on December 9, 2011).